this gives me the motivation and inspiration to finish my projects and become the best muslim that i can be. it shows how u can serve others better without sacrificingc your own happiness. How do you integrate productivity for Allah sake? If you could sum up The Productive Muslim in three words, what would they be? What other book might you compare The Productive Muslim to and why? Three personal favorite and effective productivity books to compare with. The Productivity Project by Chris Bailey, Getting Things Done by David Allen, and Getting Results the Agile Way by J. D. Meier. The Productive Muslim book helps me strengthen and internalize the importance of being productive as a Muslim. The goal is not for material gains. Results are an outcome of Allahs' will. Investing in being productive to seek Allahs' pleasure and Use productivity as an act of worship. MashaAllah. While waiting for this audiobook release. 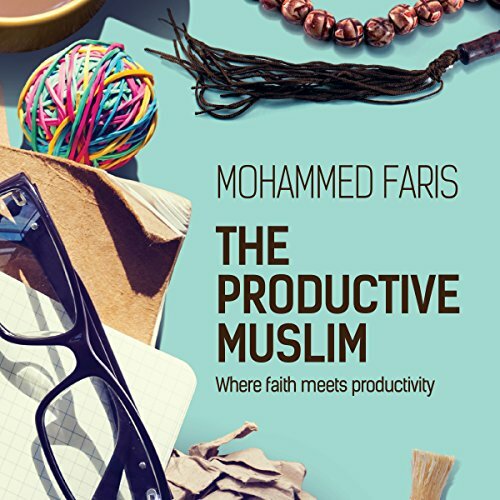 I believe this audiobook needs to be read by the author himself, Mohammed Faris. Despite a very small unnoticeable narration pronounciation, his performance narrating the message was clear and easily absorb. Consistency in delivering his energy in his voice throughout the book. MashaAllah. TabarakAllah. A few times I got home and reaching the office car park, I was still in the car listening to complete the chapter. This is because there is just so much knowledge to reflect on from each chapter of the audiobook. Connecting the dots. MashaAllah. I would like the publisher or author to upload the bibliography of the book accompanying this audiobook. Most of the reference made in the book needs to be checked and read deeper. Especially when author narrates the translation and quote from the Quran. I would like to know which Verse from which Surah it was Quote. JazakAllahu khair. I have been reading and listening to books on self-development for several years now, and they have completely changed my life. This books takes it to the next step by combining the two very important aspects of spirituality and productivity. Faris refers to several books and concepts that I have read about and incorporated in my life. I already had knowledge about a lot of the information he discusses related to exercise, nutrition and sleep, but then again I have read books and books on each these aspects. If you want one single guide to have access to all of the critical information you need to live a healthy, productive and meaningful life, then this book is a great choice. An immaculate book for all. It's complete! An immaculate & beneficial book for all walks of life. Really recommend everyone to read this book. This book will open doors of understanding Muslims and the reality of Islam. I am a very lazy and unmotivated person, and this book addressed some serious issues from many unexpected angles that I would never have thought about. The book is comprehensive and brilliant that I started Implementing things from it right away and I saw amazing amazing progress, instantly. If you are a non productive Muslim like I am, then you need this book in your life right now. May Allah bless Mohammed Faris and reward him greatly for this beautiful gift to all of us. The content was extremely well thought out and structured. Presentation was amazing as it came from author himself. Highly recommend for audible, as for me it accompanied me on my commute to work and it totally rejuvenated my everyday routine and inspired me to work harder! MUST read if you're a Muslim! first audiobook of 2019 =) 5 shiny stars for this work.. a TON of excellent reminders and insights to apply into our lives. This is an Islamic version of personal development material and will be well worth your time to listen to/read. I initially got the audiobook version and now my hard copy is on its way to gift it to a friend. Give it a good read, apply the stuff, do great things out there seeking God's pleasure, and inshAllah you'll reap the benefits in the next life. i would recommend this book to every person struggling with their life!!! buy it ASAP!! Very useful. Every muslim should listen to this book or have a copy of it.